Ever since he was a child, David was actively inspired by the Muses to write. Whether it was stories of the Smurfs when he was 7 or Star-Trek-meets-Greek-myth short story in his senior year in high school, he has always desired to share adventures. 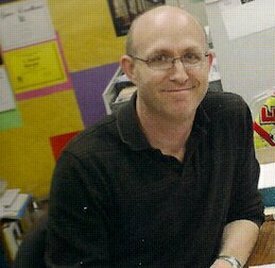 Becoming an English teacher simply fueled his desire to write, and from this, as well as a love of fantasy and comic books (especially Wonder Woman), he created his Task Force: Gaea series. David's tale of mythic fantasy in the world of the Olympian gods, Task Force: Gaea, will be five books, plus one anthology, Of Mortal Bonds, that leaps out of Memory's Curse, to tell an additional set of stories. He is also working on a Celtic myth-inspired series called The DragonHawk Cycle, with the first novel being The Quest of Wyndracer and Fyrehunter (2017 or 2018). David goes to various conventions across the country to meet fans, sign books, and just be a total geek. For more information, please check his website: http://www.davidbergerbooks.com. Four modern day strangers—Dan, Aleta, Brandon, and Sarah—learn they are bound by prophecy to fix what the Olympeian gods have broken. Gifted with ancient magic from long lost civilizations, they must master their powers while contending with forces escaping from the Underworld and also find a way to repair the Sacred Scales, destroyed by an angry goddess long ago. Their success lies with Apollo, a god whose earthbound journey provided the means to fulfill the prophecy. These four mortals—a teacher, a scientist, a zoologist, and a potter—join the United Nations Task Force Division sworn to protect an endangered world, becoming the sole team—codename: GAEA—who can fight the monstrous threats and bring Order to a world plunged into Chaos. Bringing together the powers of the ancient gods and the strength of the human spirit, the members of TASK FORCE: GAEA may have to sacrifice that which they hold dear to be their only key to success. Can mortals succeed where gods cannot go? For Aegis, Zodiak, Aether, and Talon, operatives in the United Nations Task Force: Gaea, life should have returned to normal after they restored the cosmic balance that a reckless elder goddess shattered, but because of the intervention of the Fates, they would never remember what life was like before. With history now unfolding the way it was supposed to, paranoia plagues this new time line, and tight-fisted governments mandate control through a pervasive military presence, DNA scans, and surveillance cameras. Inexplicable occurrences all over the world give way to a new mission for Task Force: Gaea when an ancient cloudlike evil referred to in prophecy only as The Nebulous One emerges from Tartaros, with the intention of devouring the Olympeian gods. But, before she can find them, all of the gods but Apollo have disappeared. Leaving chaos and human corpses in her wake, she oozes her way across the globe to satisfy her hunger. Apollo will not face this threat alone, and it then becomes a race: will he and Task Force: Gaea find and vanquish this primordial goddess without falling prey to her power before she finds the gods? Aegis and his teammates, perhaps as a side effect of their encounters with The Nebulous One, have to battle personal demons in the form of potent memories that could jeopardize their mission’s success, seemingly insurmountable obstacles that could indeed mean the end of their team. Starting in antiquity and moving to the modern day, this epic battle between good and evil leaves both immortal and mortal alike wondering whether memory can be a blessing… or a curse. Zodiak’s identity quest to ancient Arkadeia may leave his teammates, Aegis, Talon, and Aether vulnerable in the modern day when a long-forgotten and powerful criminal—a son of Gaea—escapes Tartaros to continue the undertaking he began millennia ago. In the wake of Lismonia’s godhunt, this new mission begins with misunderstood prophecies and a series of gruesome murders ultimately leading to a betrayal that could tear apart the team. And, Gaea’s son has just begun. The investigation brings to light The Liar’s Prophecy, and an unsuspecting Task Force: Gaea has no choice but to see it to completion, an enterprise that could bring them to the threshold of madness. Lies and secrets surface that reveal mysteries surrounding not only the gods of Olympos, but also Aegis, Talon, Aether, and Zodiak—these secrets will forever change the nature of Task Force: GAEA. One among them is fated to fall because even death cannot protect you from your past.